One of the most comment questions we get asked is: “Where to eat on the Gili’s?”. That’s why we thought it’s a good idea to create a page where we will share our favorite restaurants and warungs on the Gili Islands with you. Welcome to Gili Foodie! Let’s start with telling you that you can literally eat for days in Indonesia and always be trying something new. Try rendang (chicken or beef with chili dressing), sate (barbeque chicken, lamb or beef with peanuts sauce), bakso (beef or fish meatball served like soup with noodles and vegetables), gulai (boiled meat or fish with coconut milk dressing), pepes (steam tofu, meat or fish combine with vegetables wrapped in banana’s leaf), gado-gado (mixed vegetables light boiled served with peanuts sauce. The Gilis a great place for foodporn lovers. From sweet to very spicy, but always fragrant, full of flavor and with a teaspoon of love. A wealth of choice in fish, meat, vegetables –and not forgetting the vegetarian tahu and tempeh. You can get almost any local dish for under $2,50 dollar, so make sure you try as much as you can while you’re here! For more info about restaurants and bars on Gili Trawangan, click here. 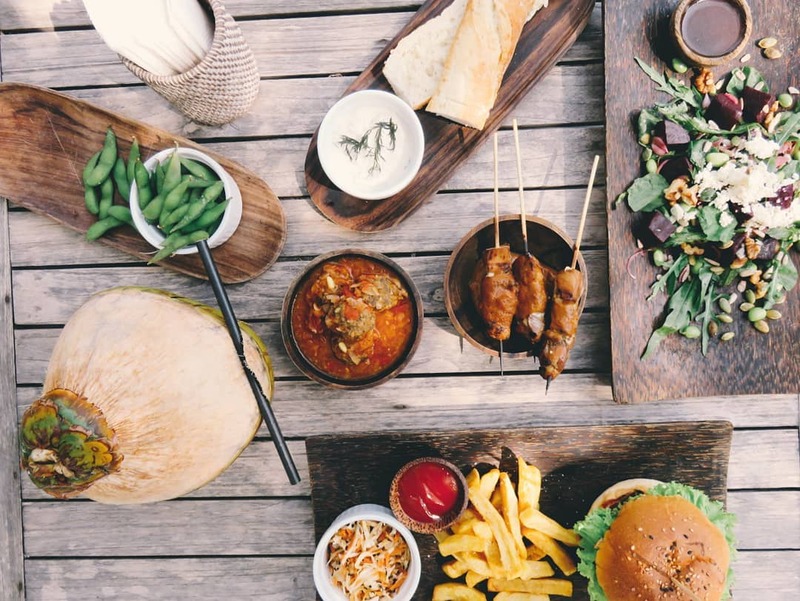 Click here to have a complete overview of all restaurants and bars on Gili Air. And check out this page if you would like to see what’s available on Gili Meno. 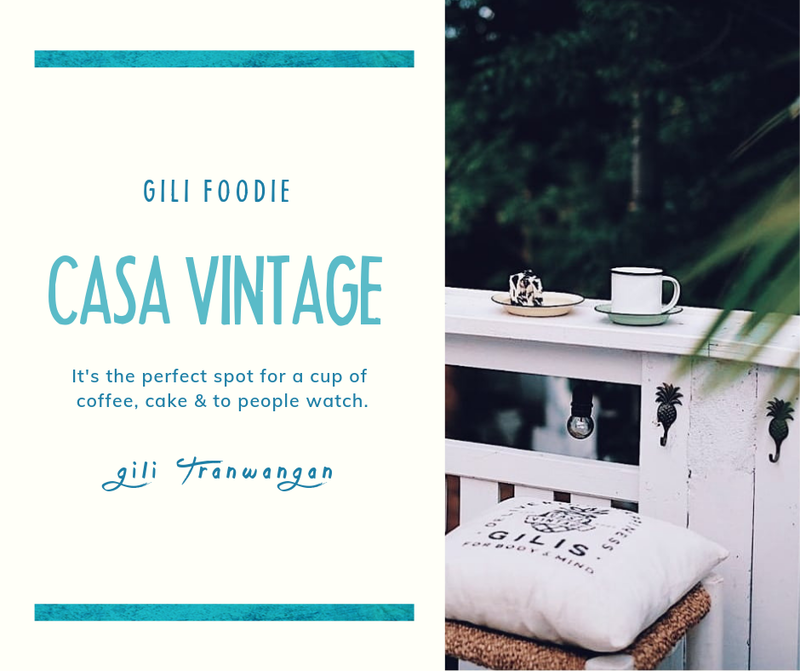 Casa Vintage serves deliciously healthy food & drinks on their rooftop bar in Gili Trawangan nestled in the central village close to the main road. They also have another beachfront restaurant on the north end side of Gili Trawangan. They offer boutique villas for daily rent and if you’re looking to buy some vintage clothing during your stay, they have an adorable vintage clothing store on the second floor of their restaurant! 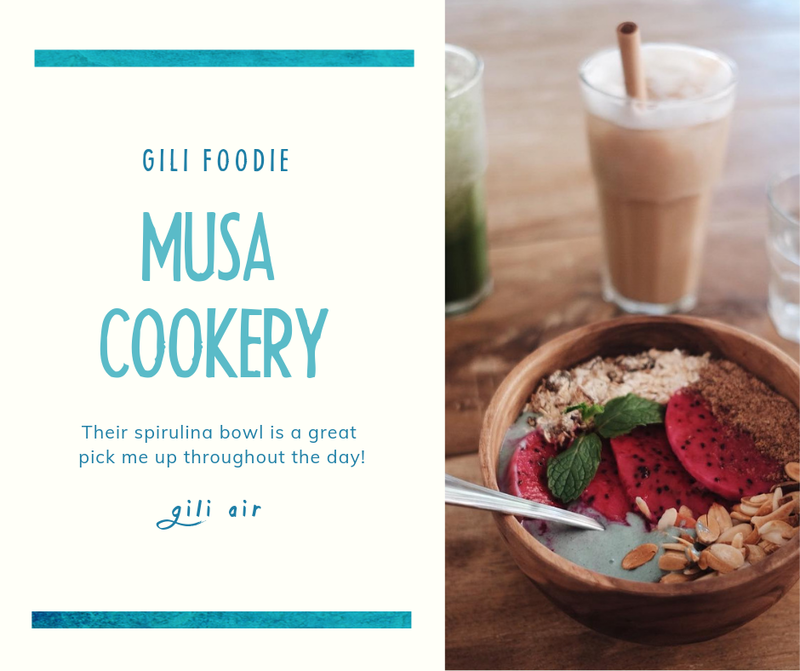 Musa Cookery is a charming healthy vegan food restaurant nestled in the centre of Gili Air – a 5-minute walk from the main road. Give their cold ‘Spirulina Smoothie Bowl’ a try! 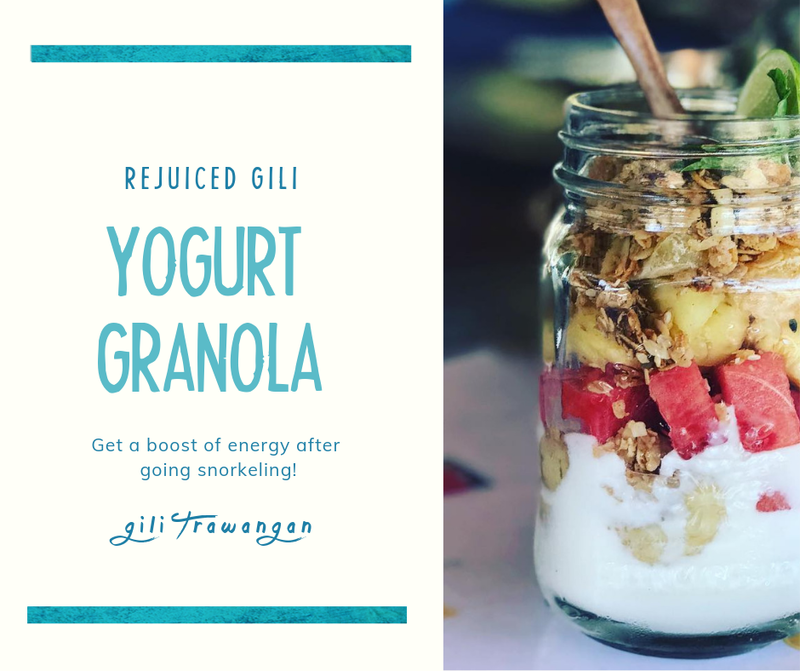 Spirulina is high in protein & vitamins and a low-calorie food and this smoothie bowl is a great addition to boosting your energy with this Indonesian heat! This is healthy juice and smoothie bowl bar located on the quiet northern part of Gili Trawangan. Enjoy the white sandy beach, swings and stunning sunsets with their homemade treats! 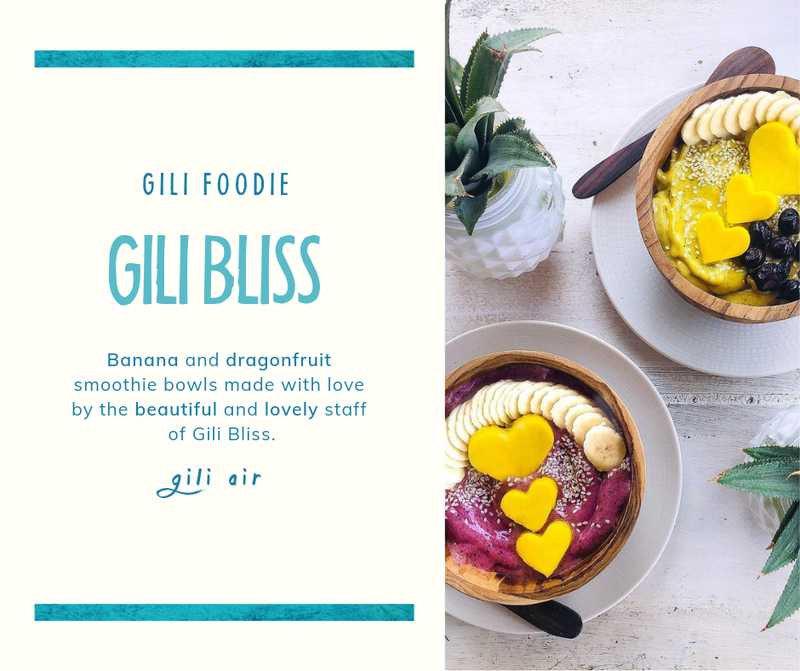 Gili Bliss is an adorable instagrammable cafe located on Gili Air, 50 meters from the harbour and in Gili Trawangan 2 minutes walking from the main road. They have healthy smoothie bowls that are always ready to freshen you up on a hot day. Ps. How cute are those mango shaped hearts?